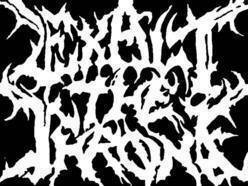 The other day, I did an interview with Christian brutal melodic metal band Exalt the Throne! Go and check them out! TBD: Who am I speaking to? ETT: The band formed in 2011 from former Benevolence and Conquered Flesh members. Originally it was a death metal band called Persecution Complex. Since then, it has had a few line-up changes, the most recent being the addition of Courtney on vocals in December. She was in the studio by January, and her first show was opening for Epica in February. ETT: "Long Live the King" is our first release. TBD: Are there any other Christian heavy bands near your area? TBD: I thought I heard you guys were on major label. Is that correct? ETT: Not yet, though we hope to be! TBD: You recently said you were releasing a new album. Has that already been released? ETT: It was released Friday, June 24th. TBD: Is there anything you would like to say? ETT: Thanks so much for taking the time to ask these questions, and for all of those who read them. We hope to bring you more music in the near future! Well that was Exalt the Throne! The whole band! Isn't that awesome?! Go follow them on Facebook and Instagram and go buy their debut album, Long Live the King !